Most astrologers have by now heard of "local space", a term introduced to astrology by Michael Erlewine in the early 70's. Many have seen or are familiar with Astro*Carto*Graphy maps introduced in the mid 80's by Jim Lewis. Probably a lot of us ordered standard relocation charts from ACS prior to the personal computer and astrological software. While locational techniques have been around for awhile, the question I hear most often is - But how do I use them? Generally speaking, most people who consult an astrologer are concerned about themselves, their relationships and their jobs. All of these issues may be influenced by where they live, directions of daily travel and the planets that are energized in a given location. I have found that locational techniques can be applied in virtually every counseling situation, in many cases giving information not apparent using the more common astrological approaches. Locational astrology is basically quite simple and straightforward; however, following standard astrological tradition, it has been kept mysterious, complex and confusing. What follows is a basic introduction, a brief synopsis of what I have found to be the most important aspects of using locational astrology, hopefully making it a usable technique rather than a theoretical concept. Most of us are familiar with standard relocation charts; converting the birth date and time to a new place with new geographical coordinates, producing new chart angles and planet house positions. An Astro*Carto*Graphy map simply takes any given date, time and location and graphically plots a map showing where planets rise and set along with locations that place planets at the MC or IC based on the local horizon. Local Space and Astro*Carto*Graphy use the same calculation, further reducing the geocentric concept and changing the perspective, bringing the planets and stars "down to earth". 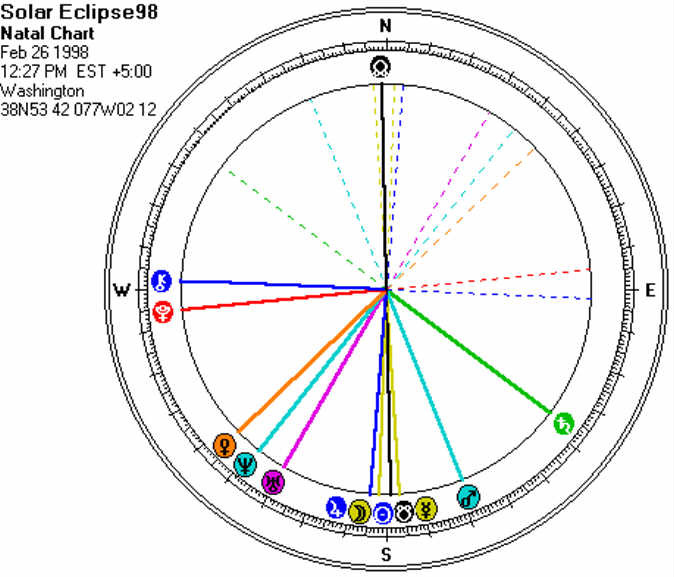 At any given time and place, an azimuth chart (one type of local space chart) will show where a planet or star is in relation to us geographically using azimuth and altitude. Or, in plain English, the direction on a compass and distance above or below the horizon a celestial body is. When you first start exploring astrology you learn that each planet has certain basic qualities and energies associated with it. In locational astrology the principles remain the same; it is these basic energies that you want to keep in mind when evaluating the chart. I generally use a 10 degree orb for the horizon and chart angles (North/South & East/West). First look at the local horizon, noting any body that falls within a 10 degree orb. Any body that falls within this orb will be highly energized and its qualities will play a very significant role. Next, look at the chart angles and note any body within orb of angular placement. These placements are the next most important as far as strength. Angular planet energies will supplement the planets on the horizon adding their own "flavor". If there are no planets on the horizon, angular placements become most potent. I am still evaluating the role of inter-planet aspects, but think that the planets conjunct the angles are more significant. The difference between a natal azimuth chart and a standard natal chart is that when a standard chart is relocated the angles change, but the planets always remain in the same relationship to one another. However, in an azimuth chart, the same relocation does not change the chart angles; North is still North, East is still East. The planetary relationships to the angles and each other do change. So, the bottom line is that by geographical movement it is possible to enhance or reduce a body's energy or intensity. Locational techniques add a valuable dimension to synastric work, providing a fascinating new view and perspective in inter-chart analysis. Any locational counseling should be highly interactive, as each client's requirements are unique and reasons for moving or travelling need consideration when recommending a relocation or direction of travel. A locational chart will help delineate the underlying theme of a given location and identify which planet or planets are being followed or shifted away from by any movement. Locational astrology can be brought right into your home, expanded to your local community, taken to a county or state level, or further yet to the country, continent and world. It is another tool that helps show how and where we are connected, to which places we've travelled, the people we've met and situations only dreamt of. Many computer programs now calculate some type of azimuth chart. Depending on the developer, it may be called something different and the presentation may change, but the information is available. Check it out!